This week, Anna Kelley, Lauren Wainwright, Francisco Lopez-Santos Kornberger and Maria Vrij join us to discuss their respective approaches to Byzantine Studies outreach: How can we boost popular interest in Byzantium? So we’re bringing everyone together for a multi-speaker presentation. Snacks and refreshments as always. Join us! Happy New Year! This week, please help us welcome James Baillie, who will be presenting: The Caucasian Prosopography Project. Snacks and wine provided as always! This week on Tuesday at 6pm, we welcome Dr. Francesca Dell’Acqua, our Marie Curie Fellow, presenting on Iconophilia! Don’t forget the change in the usual day and time. Wine and snacks provided as always! Tomorrow we welcome Dimitris Morfakidis and Francisco L-S. Kornberger, presenting on Byzantine and Modern Greek studies in Spain at the University of Granada. Snacks and refreshments provided as always! 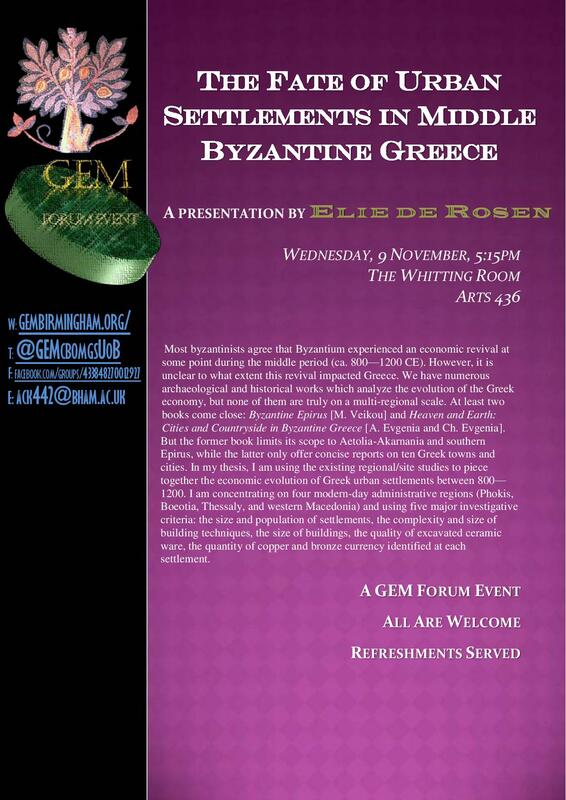 This week we welcome Elie de Rosen who will present on Greek urban settlements from 800-1200. Wine and snacks provided as always! Living and Researching in Istanbul! 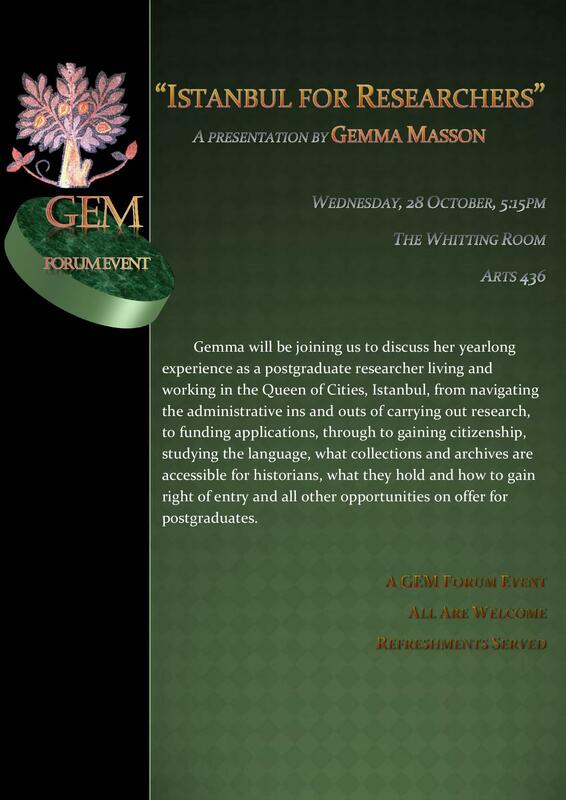 This week we welcome Gemma Masson returning from a year abroad in Istanbul! Wine and snacks provided as always! 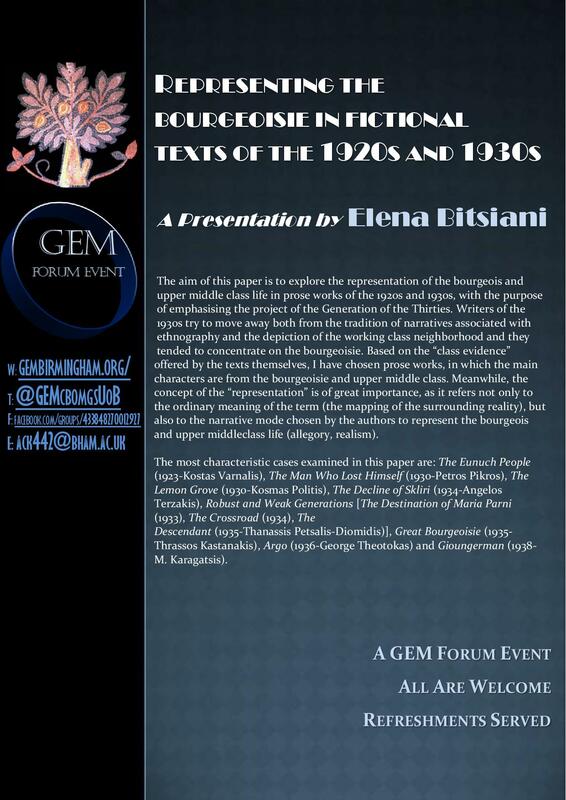 This week we welcome Elena Bitsiani to present on the representation of the Bourgeousie during the 1920s and 30s. Come to support Elena! refreshments are provided and all are welcome as always.